It’s not a new idea, the Romans extensively used a form of Underfloor heating 2000 years ago known as Hypocausts – which worked by raising the floor of a room off the ground on a series of stone pillars, thereby allowing hot air and smoke to be filtered under it through holes leading to an exterior fire and, consequently, supply a steady stream of heating to the house through convection. Hypocausts were labour-intensive to operate as a large exterior fire or furnace had to be supplied with wood to maintain heat levels. Because of this, hypocausts were often only a feature of public bath houses and large private villas owned by wealthy families. Luckily, in our modern world, we are able to replicate the results of this great Roman invention in a very clean, efficient and cost effective way..
Underfloor heating from Enterprise will provide you with consistent room temperatures – as well as improved air quality, more usable room space, total temperature control and energy savings of up to 30% compared to traditional heating systems. Enterprise can accurately design and specify the correct underfloor heating solution for your chosen project. This includes heat loss calculations, flow rate settings, pipe layout diagrams and manifold positioning contact us for further information. Underfloor heating from Enterprise is much more energy efficient than traditional central heating systems. Operating at much lower temperatures, underfloor heating provides a constant, even desired heat to the designated areas, as and when required. State of the art heating controls allows multi programmable settings whilst remaining completely user friendly. 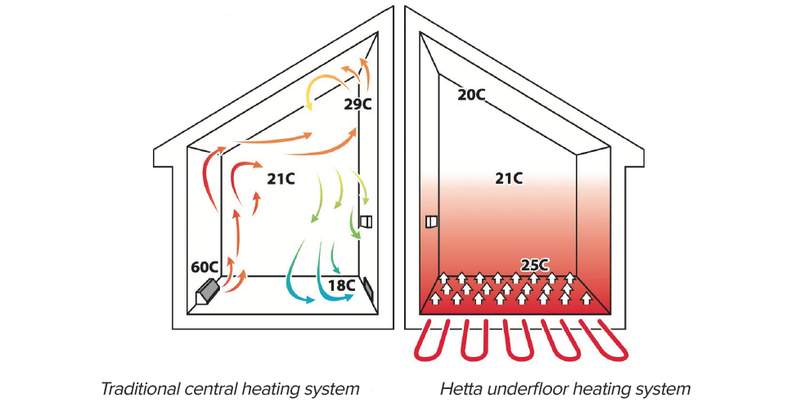 Underfloor heating gives an even spread of heat across the floor area, eliminating cold spots. Warmth is produced from the base upwards. Without the need for radiators, you can place your furniture where you want. Our range of Underfloor heating is completely invisible and is near to silent during operation. We offer many solutions for both new build, and refurbishment projects. For full house projects as well as single room applications, regardless of floor construction material, Enterprise offers a solution. Underfloor heating systems can be easily integrated with existing heat source including renewable sources. 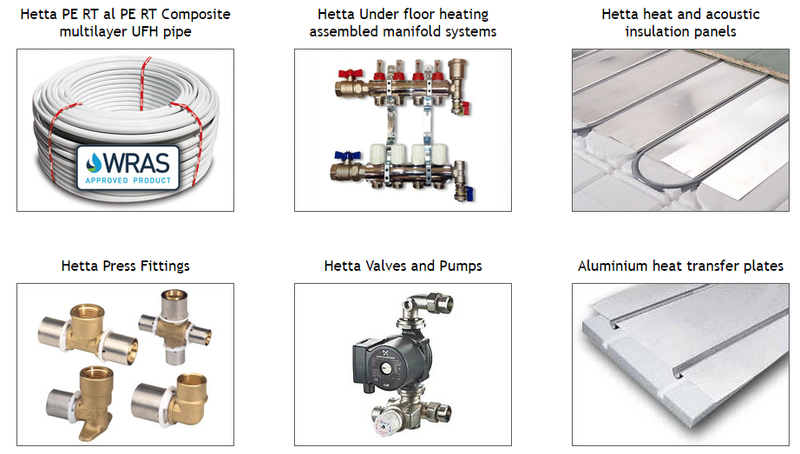 The heating pipes we use from Hetta, come with a 50 year manufacturer’s warranty. Enterprise offer complete underfloor heating single zone packs that contains everything required to install an underfloor heating solution to your chosen floor area. These packs are only suitable for floor areas where one zone (thermostat) control is required and come with sufficient pipe supply for the specified floor area, based upon 200mm pipe centres, assuming the manifold is centrally located. 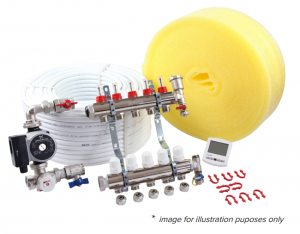 Manifolds are pre-assembled and include isolating ball valves, adjustable flow meters, fill and drain points, automatic air vents and pipe connectors for 16mm pipe (15mm connectors available). Packs are available in numerous sizes from 20 m2 right up to 160 m2 (Metres Squared).